Andover (/ˈændoʊvər/ AN-doh-vər) is a town in the English county of Hampshire. The town is on the River Anton, a major source of the Test, 18 miles (29 km) west of the town of Basingstoke, both major rail stops. 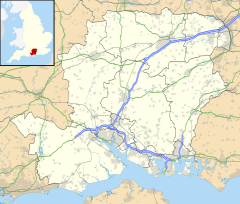 It is 15 miles (24 km) NNW of the city of Winchester, 25 miles (40 km) north of the city of Southampton and 65 miles (105 km) WSW of London. Andover is twinned with the towns of Redon in France, Goch in Germany, and Andover, Massachusetts in the United States. Its name is recorded in Old English in 955 as Andeferas, and is thought to be of Celtic origin: compare Welsh onn dwfr = "ash(tree) water". At the time of the Domesday Book (1086) Andover had 107 adult male inhabitants and probably had a total population of about 500. It was a relatively large settlement; most villages had only 100 to 150 people. Andover also had six watermills which ground grain to flour. The town's relative isolation implies a market for grain and flour. In 1175 King Richard I sold Andover a charter granting certain townspeople rights and forming a merchant guild which took over the governmental rights, see ancient borough. The members elected two officials, bailiffs, who ran the town. In 1201 King John gave the merchants the right to collect royal taxes in Andover themselves. In 1256 Henry III gave the townspeople the right to hold a court and try criminals for offences committed in Andover. Andover also sent MPs to the parliaments of 1295 and 1302–1307. The town was ravaged by two serious fires, one in 1141 and another in 1435. As well as the Church of St Mary the town had a priory and a hospital run by monks, dedicated to St John the Baptist, and also a lepers hostel to St Mary Magdalene. In 1538 during the Reformation Henry VIII closed the priory and the hospital. In 1571 a free school for the boys of Andover was established in the grounds of St Mary's Church. This in time became Andover Grammar School, and in the 1970s it became John Hanson Community School. The school has occupied various sites in the town over the course of its history and is currently located in Floral Way. During the 18th century, being on the main Exeter – Salisbury – London road, the place became a refuelling or overnight stop for stagecoaches and other passing trade. More than 30 coaches passed through the town each day. In 1789 a canal to Southampton was opened, though this was never a commercial success and closed in 1859. In 1836 the Borough established a small police force: for the most part two constables and a gaoler. Andover was linked to Basingstoke and thus to London on its new railway to Salisbury (shortly thereafter to Exeter beyond) when Andover junction station was opened on 3 July 1854. A railway from the 1860s ran to Southampton, built on the bed of the canal, for about 100 years, until 1964. The land, together with the adjacent gasworks and P.M. Coombes woodyards, was then sold to the TSB Trust Company who later built their headquarters there. The population grew from 3,304 in 1801 to 5,501 in 1871. During the 19th century the town acquired all the usual additions, a theatre in 1803, gas street lighting in 1838, a fire station and cottage hospital in 1877, a swimming pool opened in 1885 and a recreation ground opened in 1887. A water company was formed in 1875 to provide piped water to the town and a system of sewers and drains was built in 1899–1902. The public library opened in 1897. Despite this burgeoning of the amenities of the town in 1845 a notorious scandal involving the hardships endured by the inmates of the workhouse led indirectly to reform of the Poor Law Act, principally involving segregation of a now-obligatory infirmary for local people from the workhouse for the able-bodied, but also better governance. The town was one of the boroughs reformed by the Municipal Reform Act 1835. During the Second World War the RAF_Staff_College,_Andover was the headquarters of RAF Maintenance Command, and gained a unique place in British history, as the first British military helicopter unit, the Helicopter Training School, was formed in January 1945 at RAF Andover. The airfield is no longer in use although the RAF retains a link to the area through the presence of 1213 (Andover) Squadron, Air Training Corps. When the RAF left the site became the Headquarters of the Quartermaster General and later Logistics Executive. Andover has a purpose built arts and entertainment venue owned & managed by Test Valley Borough Council called The Lights. This hosts professional artists throughout the year. The venue has a 249 fully raked auditorium, a business suite, a dance studio and a craft studio. The Lights has attracted international artists including Michael McIntyre. In the 1950s the Borough Council was approached by the Greater London Council to become an overspill town, to build houses and take people and industry relocated from the overcrowded capital. Some contend that had the old Borough Council still been in charge this would never have been agreed. But it was, and in 1961 the plan was drawn up to expand to a population of some 47,000 by 1982, with 9,000 new homes to be built. When the Borough Council and Andover Rural District Council were abolished in the local government reorganisation of 1974, and replaced by Test Valley Borough Council (which included the land down to the edge of Southampton in the south) Andover became an unparished area, secularly, for 34 years. Andover Town Council revived in May 2010, the townsfolk electing an initial 19 members, and since 2017 has included a Town Mayor. About 1 hour 5 minutes from London by train, Andover's centre is convenient to those in the London commuter belt working short-to-average shifts, and high property prices commanded in outlying villages reflect the way in which they serve as easily commutable for senior executives with similar shifts, many of whom retire to the area also. Tensions between town and country — "old" and "new" exist in some measure, and more expansion is planned by Central government and taking into account the need to bolster local businsses. Today the population of Andover is over 52,000 and it is one of four Major Development Areas in Hampshire, identified for large growth in housing. Plans are in place to build 2,500 homes northeast of the town. Andover has its railway station quite centrally. It is run by South Western Railway. From here trains run to Salisbury, Yeovil Junction, Exeter St Davids, Basingstoke and London Waterloo (with a usual intermittent stop of Woking) and some stopping services as Whitchurch and smaller nearby places. In April 2017, The Department for Transport announced that train times between Andover and London Waterloo will be reduced by nearly 20 per cent after awarding the South Western franchise to South Western Railway; journey times to/from London Waterloo cut by about 11 to 13 minutes since late 2018. The A303 essentially bounds the town to the south, the main London to WSW direction road. Particularly for good links to Reading and Swindon respectively, roads link to the M4 motorway, to the north, the shorter one by way of the A34 trunk road to Birmingham and beyond, the other via Marlborough, Wiltshire. In 2002 the town became part of the Cango bus network. In the late 1980s, Andover was one of the first towns in England to have a cable television franchise, Andover Cablevision. The pavements throughout the town were dug up to lay the cables and for a time the service was very successful. Andover Cablevision even ran its own local TV channel, 'Town TV', featuring items of local interest. In May 2008, a new radio station was launched in the town called Andover Sound. It broadcasts across North West Hampshire on 106.4FM and online at www.andoversound.com from studios based in East Street in the town. The radio station has picked up a number of awards since launching including a New York Festivals Radio Award, the Radio Academy South Station of the Year award and the Arqiva Commercial Station of the Year award. In April 2010 the radio station was nominated for two Sony Radio Academy Awards for Station of the Year (300,000) and News Journalist of the Year and came away from the ceremony with a silver in the journalist category. The radio stations name was changed to The Breeze in 2012 when a new company took over. Passionate participation (including corporate social responsibility). Its board includes representatives of local businesses; officers and members of Hampshire County Council, Test Valley Borough Council and Andover Town Council; heads of local schools and colleges, and local residents such as the former local MP, Sir George Young. The Vision has organised events such as the Christmas lights switch on, the Big Fest summer culture festival and food fayre. It also backs activities like the Riverside Walk and the Chapel Arts centre. In February 2011, Andover became a Heart Town. This means that the town will make healthy living a top priority. The Andover Vision are working with the British Heart Foundation on this project. Andover, in common with much of the UK, experiences a maritime climate type, reflected in its limited temperature range and lack of rainy/dry seasons, although rainfall does tend to peak in winter and reach a minimum in summer. The nearest met office weather station to Andover is Leckford, about 5 miles (8 km) south of the town centre. The absolute maximum temperature recorded was 34.7 °C (94.5 °F) during August 1990. In an average year the hottest day will achieve a temperature of 29.0 °C (84.2 °F). In total 12.8 days should have a maximum temperature of 25.1 °C (77.2 °F) or above. Total rainfall averages 805 mm per year, with at least 1 mm falling on 124 days. All averages refer to the 1971–2000 observation period. Bill Rawlings was another Andoverian who began his career at the club. He went on to join Southampton in 1919 where he had a successful career scoring 175 goals in 327 league appearances, making him their third all-time goalscorer behind Mick Channon and Matthew Le Tissier. He also won two England caps in 1922 against Wales and Scotland respectively. He also played for Manchester United and Port Vale. Ronnie Bond, Pete Staples and Reg Presley of The Troggs, a rock band who had a number of hits in Britain and the United States such as "Wild Thing" and "Love Is All Around", were all born in Andover. The eminent 19th-century surgeon William Morrant Baker was also born in the town. He was best known for describing the condition Baker's cyst as well as being a lecturer, surgeon and governor at St. Bartholomew's Hospital. Campaigner and broadcaster Katie Piper was brought up in Andover and retains strong links to the town. Roger Panes, a member of the Exclusive Brethren Christian evangelical cult, killed his family and himself in Andover in 1974. Lord Denning, judge and Master of the Rolls, attended Andover Grammar School from 1 October 1909. Hanson Turner is a recipient of the Victoria Cross. James Blunt grew up and lived in St Mary Bourne. Cricket: Andover Cricket Club play in the Southern Premier Cricket League. Football: The town has two Non-League football clubs, Andover New Street F.C. which play at Foxcotte Park and Andover Town F.C. who play at the Portway Stadium. Andover was home to former Southern League side, Andover Football Club, which was dissolved in the summer of 2011. Andover Lions F.C., a new club formed shortly afterwards, competed in the Hampshire League 2004 and Hampshire Premier League between 2011 and 2017. Hockey: Andover is home to Andover Hockey Club, the first club in Hampshire to attain the "Club Mark" for its organisation and child safety policies. AHC has 4 men's, 4 ladies', and 2 veterans' sides, and 250+ juniors playing in Hampshire Leagues. They were crowned National Vase Winners in 2007. In Agatha Christie's Hercule Poirot mystery The A.B.C. Murders, Andover is the site of the first murder. In Episode 6 of Series 40 of Have I Got News for You, team captain Paul Merton mentions "pig stretching in Andover" as an obscure cultural activity, despite the tradition's non-existence. In Sir Arthur Conan Doyle's "The White Company", Andover is mentioned as sending levies of troops to France. ^ "Andover Town Twinning". Andover Town Twinning Association. Archived from the original on 13 November 2010. Retrieved 19 April 2011. ^ "Andover, Hampshire, England twinning". Andover MA Town Council. Archived from the original on 5 May 2011. Retrieved 19 April 2011. ^ a b Tim Lambert. "A Brief History of Andover, Hampshire". Retrieved 7 March 2010. ^ "Hampshire Hospitals NHS Foundation Trust Timeline" (PDF). Hampshire Hospitals NHS Foundation Trust. ^ "The Lights, Andover, Test Valley Borough Council". Test Valley Borough Council. ^ "Michael McIntyre To Appear At The Lights In Andover". Love Andover. ^ "Journey Times To Be Slashed To The Capital". Andover Advertiser. Retrieved 31 December 2017. ^ "Andover Sound Sony Success". Andover Sound. 11 May 2010. Archived from the original on 4 October 2010. Retrieved 27 August 2010. ^ "Andover Vision - Test Valley Borough Council". www.testvalley.gov.uk. 1 December 2017. Retrieved 8 February 2018. ^ "Editor's Comment (From Andover Advertiser)". Andoveradvertiser.co.uk. 3 December 2010. Retrieved 29 May 2013. ^ "Home". Andover Vision. Archived from the original on 17 March 2012. Retrieved 29 May 2013. ^ "Pumped up for Heart Town (From Andover Advertiser)". Andoveradvertiser.co.uk. 18 February 2011. Retrieved 29 May 2013. ^ a b "1971-00 Days >25c". Retrieved 3 March 2011. ^ "1960 minimum". Retrieved 3 March 2011. ^ "1971-00 average coldest night". Retrieved 3 March 2011. ^ "1971-00 average frosts". Retrieved 3 March 2011. ^ "1971-00 Rainfall". Retrieved 3 March 2011. ^ "1971-00 Raindays". Retrieved 3 March 2011. ^ "Climate Normals 1971–2000". KNMI. Retrieved 3 March 2011. ^ "englandstats.com – Player Report – William Rawlings". Retrieved 28 December 2007. ^ "Passed/failed: An education in the life of Sam Baker, editor of 'Cosmopolitan' magazine". The Independent. 18 May 2006. Retrieved 19 April 2011. ^ "Strictly Stars at School". portwayjunior.co.uk. 2011. Archived from the original on 19 May 2014. Retrieved 19 May 2014. ^ "Roger Panes - Confirmed Murder/Suicide - WikiPeebia.com - PBCC". WikiPeebia.com. Retrieved 25 May 2017. ^ "Look Around, the newsletter of the Andover History and Archaeology Society". 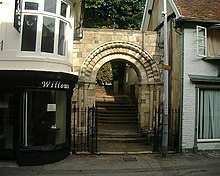 www.andover-history.org.uk. 2014. Retrieved 4 January 2017. ^ Robinson, James (13 February 2017). "Andover Lions club secretary Chris Paris admits club may not return next season after dramatic exit from Hampshire Premier League". Andover Advertiser. Retrieved 7 September 2017. Wikimedia Commons has media related to Andover, Hampshire.